I am related to the grasshopper and the katydid. I am approximately 1 inch in length, have great vision and with my compound eyes can see in many different directions at once. My wings are usually too small to allow me to fly. 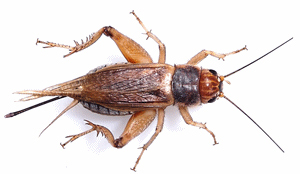 If I am a male cricket, I can use my wings to make a chirping song instead. I feed on plants and sometimes other insects. During the warm summer months I am found in fields, beneath rocks, or under some other yard debris. I go through three stages of development: egg, nymph and adult. My egg is laid in the soil during the fall. When spring arrives my egg hatches. As a new cricket I look like a small adult. I grow each time I shed my skin (molt). I will live for about one year.